If you need to use a headset with your PC, then you will know how frustrating it is continuously swapping over speaker and microphone cables. This is even worse if the PC is parked in a dark corner and the hard-to-read writing on the sound card sockets is covered in dust. This simple switch box eliminates all these problems. It sits on top of the desk and connects to the PC with stereo one-to-one cables. On the rear of the box are sockets for the PC speaker and microphone connections and the existing speakers. On the front of the box are the sockets for the headset microphone and headphones, an input for an external microphone and two switches. 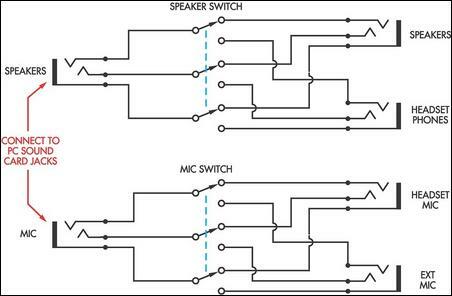 One switch is used to direct the sound card output from the PC to either the existing speakers or the headphones. The second switch connects either the headset microphone or the external microphone to the input socket of the PC sound card. The switches used were 3 position 4 pole rotary switches with the last pole unused and adjusted for 2-position operation. All sockets were stereo 3.5mm types. This multiple switching arrangement is very flexible and is especially handy if you want to use an external microphone while monitoring with headphones. The ground wire as well as the left and right wires are all switched to prevent noise that could otherwise be induced into the microphone input through joining separate earths. For the same reason, a plastic case is used so that the earths of the sockets are not shorted together as would happen with a metal case. You will require two additional short stereo extension cables to connect the box to the PC.